Hang around a business coach very long and you will likely hear them talk about the “Shadow Effect.” Shadows don’t represent the absence of light, but the distortion of light. We all carry gifts and abilities that can turn into something unsavory in their distortion. We conduct corporate retreats where we sometimes have leaders share the perceived strengths and challenges of one another. I almost always know what the challenging elements of a person’s leadership will be once I hear the strengths. Strengths are generally linked to the challenges. The interesting thing is that they are often so closely linked that we are often unaware of the impact it has on others. I have what some might call the curse of confidence. I operate with a lot of conviction about many things and have been told that I do a reasonably good job at articulating my thoughts. It depends. My teenager once told my wife that it didn’t really make any sense to share her opinions with me because I had already made up my mind. When others were on the verge of stoning a woman for her sin, he turned the condemning finger on the crowd and challenged the accused to go and sin no more. In other words, I have come to show mercy and grace to those most would cast aside, but I carry deep conviction about sin and the best life possible for you to live. Intolerance to sin doesn’t mean inhumanity to others. Tough line to walk. When a bank I worked for got acquired, my investment post was eliminated in a small town in Texas. I ended up applying for a “Fixed Income Market Specialist” job in Chicago. A few interviews into a long day, I realized it was basically a sales job. My last interviewer asked me a challenging question, “What makes you think you can sell?”. The first thought that came to mind was that I didn’t particularly like salespeople (or the idea of being one). I pray that I always carry that kind of conviction about the truth that surpasses understanding (and prevailing cultural norms), but approach it with others with the same kind of mercy and grace that our Father modeled for us in Jesus. What are the “Shadow Effects” of your strengths? Do you operate with a lot of conviction? 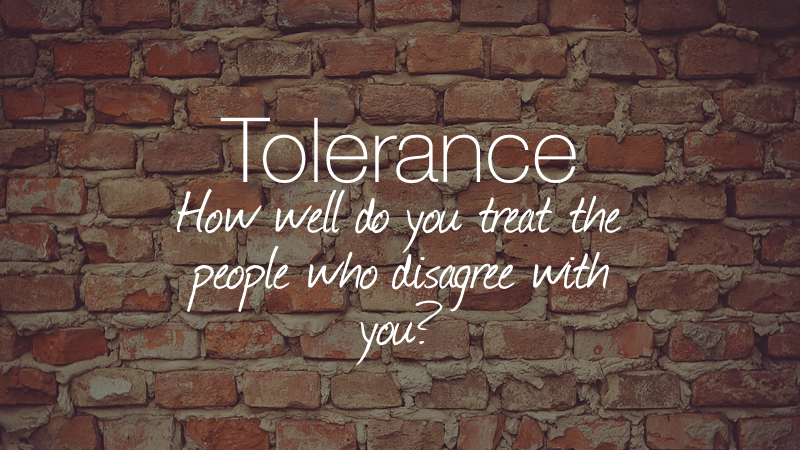 How well do you treat the people who disagree with you?